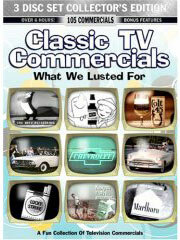 TV history wasn't just made in prime time, it was created in the daytime as well. Game shows weren't exactly new to the world, they existed on radio long before television came along. As television became more popular there had to be something to fill the daytime blocks. People grew tired of soap operas, so in the late 40s, one of the longest-running collaborations in television began - when Mark Goodson and Bill Todman brought the game show medium to new heights. In 1950, What's My Line, one of Goodson/Todman's earliest successes, began what was to be a long run. The object of this game - a panel of 4 celebrities try to guess the occupation of the guest in yes or no question form, with each incorrect answer being worth (get ready for this one) five bucks! With a maximum of fifty dollars won if the panel gets stumped entirely. At the end of the show, a famous person comes out and tries to stump the panel in a segment called The Mystery Guest. Gameplay would be the same for this round, only this time the panel was blindfolded. The Mystery Guest segment brought on some of the most talked about people in the biz - from the Lone Ranger Clayton Moore to future president Ronald Reagan. Hosted by John Daly, the show ended its run on CBS in 1967, but would re-surface a year later for a long run in syndication. 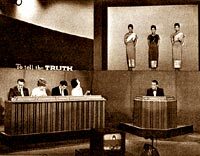 Some of the What's My Line panelists simultaneously became a part of G/T's second show, To Tell the Truth. It was similar to What's My Line but with a twist. This time, the panel had to figure out which person (in a three person line-up) was telling the truth about his odd occupation. 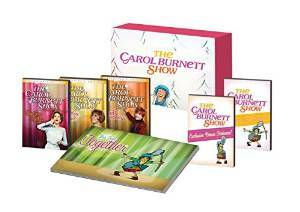 Aside from regulars Kitty Carlise and Arlene Francis, panelists such as Orson Bean, Tom Poston, Betty White, and even Today Show critic Gene Shalit would decipher who was the truth teller. 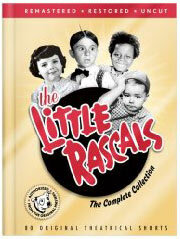 Hosted originally by Bud Collyer (and later by Gary Moore), it became another signature show for G/T. But it was far from the last. As the 1960s began, TV entertainment was taking its permanent hold over the country and Mark Goodson and Bill Todman had a major role in that success. 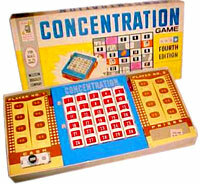 As the team entered into the tumultuos decade, new hits were devised such as "Concentration", a game where prizes were matched on a game board to reveal a picture/word puzzle. For a time, Concentration was the longest-running gameshow on TV. Also new, a unique game called The Price is Right hosted by game show great Bill Cullen, where people bid on prizes to win them - yet another G/T success. In 1961, yet another new concept was unveiled by G/T Productions, a game in which contestants guessed a specific word from their partner's one-word clue - Password. 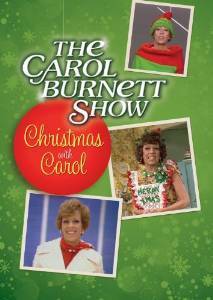 Hosted by Allen Ludden, Password paired stars to play with ordinary people to win money. 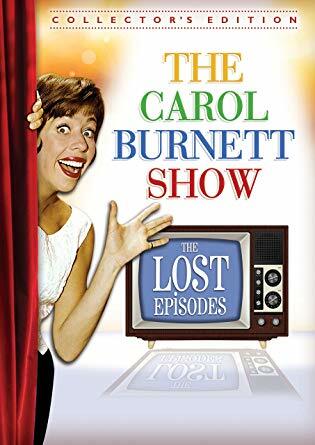 Most of the celebrities who were panelists on other G/T shows were guests on this one, even throughout the show's many reincarnations. A year after Password opened shop another word game debuted from Goodson/Todman, hosted by comedian Gene Rayburn that again involving the matching of words - appropriately enough called The Match Game. The idea was simple; the player was asked to fill in the blank in a phrase with their chosen word, hoping to match words written down by celebrity panelists. More matches meant more points. This version of Match Game (which ended in 1969), was far different than the more well-known Seventies' version. Many of the Goodson / Todman originals underwent superficial production changes when they were revived in the next decade. As the 1960s ended, so did the original runs of Password, To Tell The Truth, The Price is Right and What's My Line?. Many were canceled because they couldn't compete with the success of newer game shows such as Jeopardy and The Hollywood Squares. As a result, G/T's crack team of producers went back to the drawing board. Since they weren't selling new concepts, they reasoned it would be advantageous to revive proven winners. One thing for sure, nobody in the business saw the success of this 2nd generation coming. 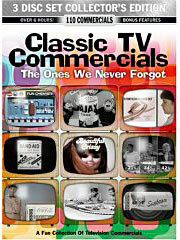 The Seventies saw the return of To Tell The Truth and What's My Line in syndication. One of the first big network revivals came in 1971 when Password and host Allen Ludden returned to daytime. 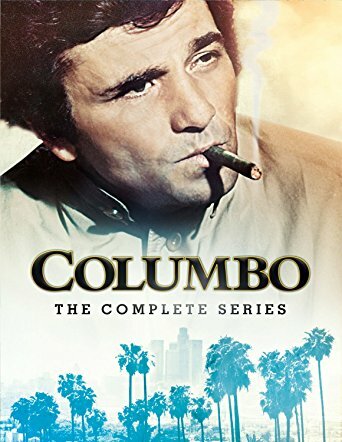 This time the show moved from CBS to ABC. This game was played the same as the previous version, only with a higher dollar value. Because ABC erased all of the episodes of this version, the only real link to this Password's past is a classic episode of The Odd Couple where Oscar and Felix appear on the show. But that's another story. 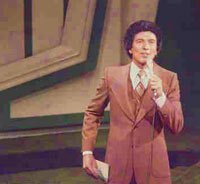 In 1974, the show's format was revamped to have only celebrities playing against each other for their favorite charities. Password All-Stars didn't catch on and was canceled in 1975. The program returned in 1979 under the name Password Plus - Allen Ludden was host again, but it wouldn't be for long. In 1980, Ludden fell ill from stomach cancer and had to pass his hosting duties on to others; first to Bill Cullen, then Tom Kennedy finished out the run in 1982. Allen Ludden passed away in 1981 (ironically from a stroke and not the cancer). A true phenomenon was the return of "The Price Is Right. 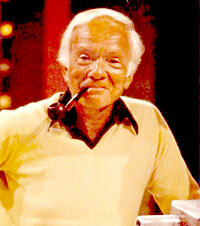 The New Price Is Right (as it was called in 1972) was just that, with Truth or Consequences host Bob Barker starring. It wouldn't take long for The New Price Is Right to become a major cornerstone in the G/T empire. In November 1975, The (no longer new) Price Is Right expanded to a 1-hour format, gaining more viewers than ever before. You have to admit, a thirty plus year run isn't too bad; it's still on the air, The Price Is Right is the longest-running game show in TV history. In 1973 , G/T brought back the Match Game - and like the other revivals, it was definitely different. 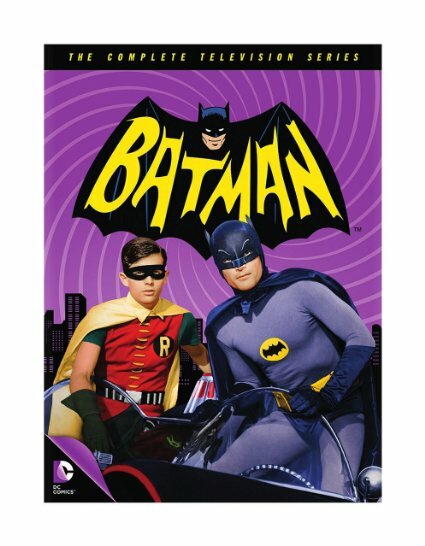 The rules were the same as the 60's version, only now the phrases were outrageous and salatious - leading to some moments on the show that are among the most talked about in TV history. Regular panelists included Fannie Flagg, Richard Dawson, Brett Somers and Charles Nelson Reilly, sparking what was to be a great run. 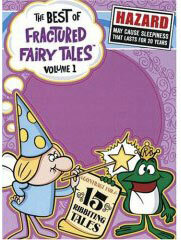 Typical questions they would be confronted with were: "Dumb Dora tried to kill herself but it didn't work. Instead of sticking her head in the oven, she stuck her BLANK in the oven" and, "I'm doing my part to celebrate the Bicentinnial. Between now and the 4th of July, I'm going to BLANK my wife 200 times." For the end game (Super Match), a head-to-head match with one of the stars determined if the contestant won the big money ($5,000). 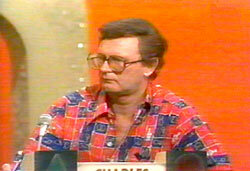 Richard Dawson was usually picked by contestants to do the Super Match, being the most popular celebrity on the panel. The Super Match portion of Match Game sparked the idea for a program revolving around audience surveys - in 1976, Family Feud was created. This was the first time that a game show was spun off from another show. Family Feud was another of G/T's now famous "simple ideas" - two families faced each other to answer questions like, "Name something associated with Christmas." For points, their guesses were matched against audience surveys of the same question. The team with the highest score on Family Feud went on to play Fast Money for $5,000 ($10,000 in later runs). The program became the most popular daytime show in the country from the moment it aired on ABC; soon after, a syndicated version of Family Feud debuted, another great success. More hits followed. 1978 brought another survey style show, this one involving a pack of oversized playing cards. Card Sharks debuted during NBC's dark period to modest ratings. At the end of the show, the winner of this game would play for $28,800 in the Money Cards segment. Only one person in the history of the show cleared the board with the top value. More G/T shows quickly entered network rotation - the aforementioned Password Plus, a show with Bill Cullen called Blockbusters and yet another revival of Password starring Bert Convy. Bill Todman died in 1979, after which the production company was renamed Mark Goodson Productions - and as quickly as you could say "C'mon down," the games kept coming at an alarming speed. The late 1980s saw the end of the original runs of Family Feud, Card Sharks and Match Game. 1983 saw the creation of The Match Game/Hollywood Squares Hour, the first ever game show hybrid. This version of MG ended in 1984 and would be the last for host Gene Rayburn. An all-new Card Sharks replaced cult classic Press Your Luck on CBS in 1986 and ran just as long as the original NBC version (three years). There was an extremely short-lived revival of Blockbusters in 1987, but the only reason it aired in the first place was to promote another revival - Classic Concentration (which aired 3 months later). Once the new Concentration debuted, no more Blockbusters! Family Feud returned with newcomer Ray Combs in 1988. Super Password continued until 1989, canceled that year along with Card Sharks. 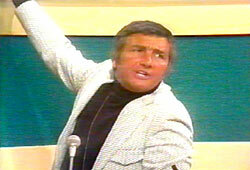 Feud would continue until 1995; by then Richard Dawson had returned to host after Combs was let go a year earlier. A despondent Ray Combs commited suicide in 1996. A successful revival of Concentration (also with Alex Trebek) was in production from 1987 to 1991 (with re-runs airing through 1993). There was a super short-lived syndicated nightime version of The Price Is Right in 1994 with some guy from The Young and the Restless hosting. Another revival, To Tell the Truth, was created in 1990 with four different hosts, (including Alex Trebek and Mark Goodson himself). The show was quietly put to sleep in 1991. Mark Goodson died in 1992, but his ideas and company live on. In December 1994, Mark Goodson Productions joined with Merv Griffin Enterprises to launch the Game Show Network. Of course, there is still The Price Is Right weekdays on CBS and a new Family Feud in syndication; though recent versions of Match Game, To Tell The Truth and Card Sharks all tanked. For over 50 years, The Goodson/Todman people brought us some quality shows and many people hope to see their old favorites come back in the near future. Until that happens, the Game Show Network airs the classic versions of many of these shows every day. Here's to Mark and Bill - for making our daytimes, good times.